A couple years ago I noticed a beat up old Belfast sink at our allotment garden. There’s a path that leads from the car park to the field and someone had left the sink just off to the side. It was as if they’d unloaded it and were going to move it onto their plot. It sat there for six months before I decided to take it home and give it new life. 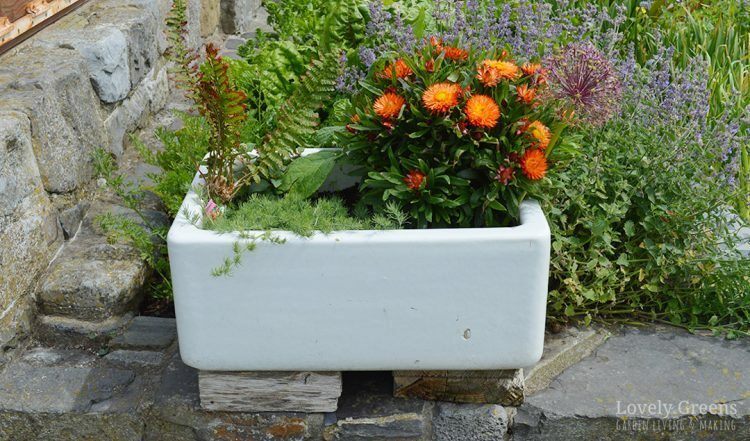 Stoneware sinks of all kinds are perfect for growing veg or flowers. They have a built in drain and the thickness of the stone can protect plant roots and bulbs from extreme temperatures. 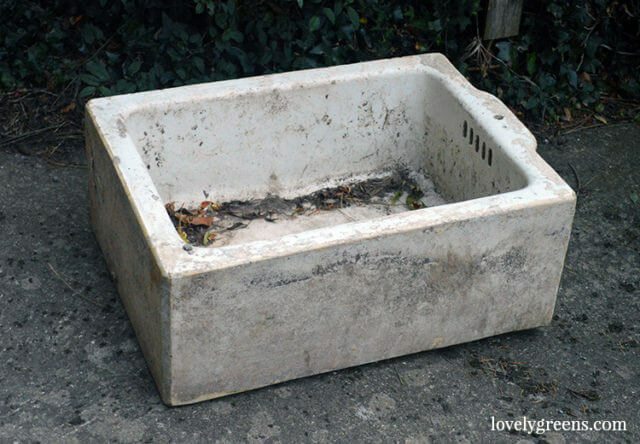 They’re also built to last so a belfast sink will become a shabby-chic garden feature that outlives all your other planters. I actually damaged my car getting the thing home and probably hurt my back a little in the process. It doesn’t look that big but it weighs a ton. A little less actually, 47 kilograms (103 pounds) of dead weight to be exact. I managed to get it into the passenger side of my little car, scraping the inner part of the door frame in the process. Moral of the story: when you find your own planter, make sure you ask someone to help you move it. Here on the Isle of Man I’ve seen quite a few vintage stoneware sinks being used to feed and water livestock. If I were looking for another one locally I’d probably ask a farmer or go to a Buy-and-Sell group on Facebook. On a small island like ours it’s amazing how things can come out of the woodwork if you just ask if anyone had one for sale. As for price, I’ve seen old ones like my own for £5-30 being sold online. In the UK, check Gumtree, Ebay, and reclamation sites. Across the pond, belfast and butler sinks are more difficult to pick up. I’ve just done a quick search on Craigslist for ‘vintage sink’ though and there are plenty of listings. Ebay is the same and my search just now turned up some pretty funky pink, blue, and green retro sinks. 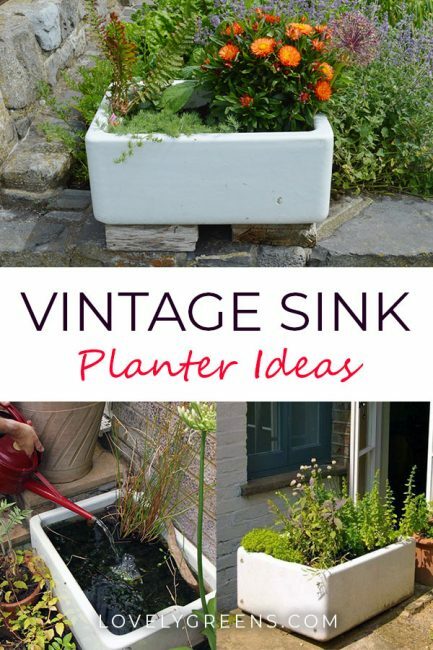 The trick to a successful vintage sink planter is to make sure the drain isn’t plugged up with soil. 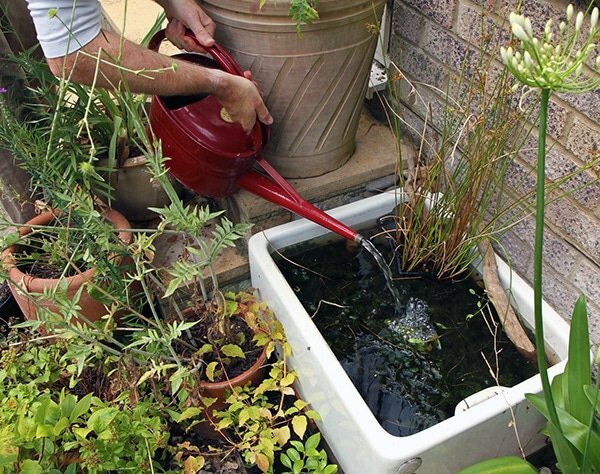 Placing gravel, crocks, shells, and pebbles in the bottom can help excess water to escape. On top of that place your compost, then whatever you’re growing. Finally, a layer of grit or gravel on top to keep the compost from drying out and eroding. Plants have no problem pushing through. For the past couple of years I’ve been growing edibles in my sink planter — rocket, lettuces, and radishes to name a few. I plan on growing veg in it again next year, but not before it puts on a pretty show in the spring. In this week’s video I show the progress of the new back garden, prune the fruit trees, and plant the belfast sink with crocus and tulips. Well first I struggle bus it up the slope — please don’t laugh. Have a watch of the planting video below and let me know as a comment what you’d plant in it if given the choice. Watch the video above to see how I’ve planted the vintage sink with spring flowering bulbs. There’s a short ad at the beginning and the video will begin just afterwards. Lovely! 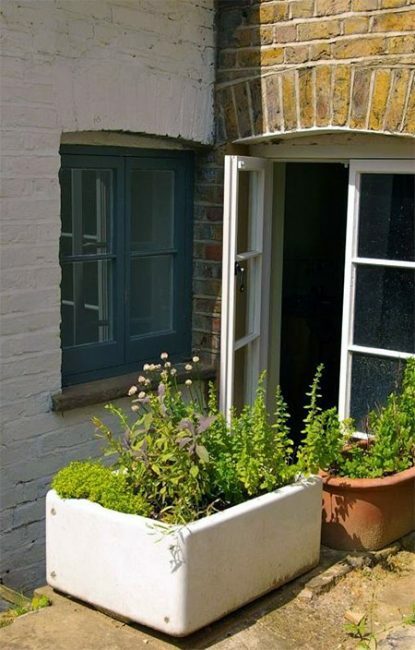 I saw mint growing in an old sink at a ‘Dig for Victory’ allotment recreation a few years ago, and it always looks stylish. It would be nice to get my hands on a suitable old sink one day! Excellent! We similarly repurposed an old livestock watering trough. 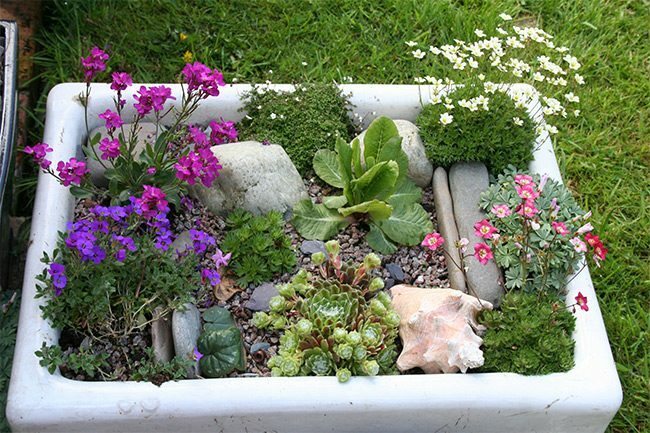 I hadn’t thought of putting some gravel in the bottom but it makes good sense. It should really help! The next time I plant it up I’ll sprinkle a layer of horticultural grit on top of the compost too. It stops weed seeds finding someplace to grow and keeps the compost moister for longer. Yum. I love arugula and cilantro. 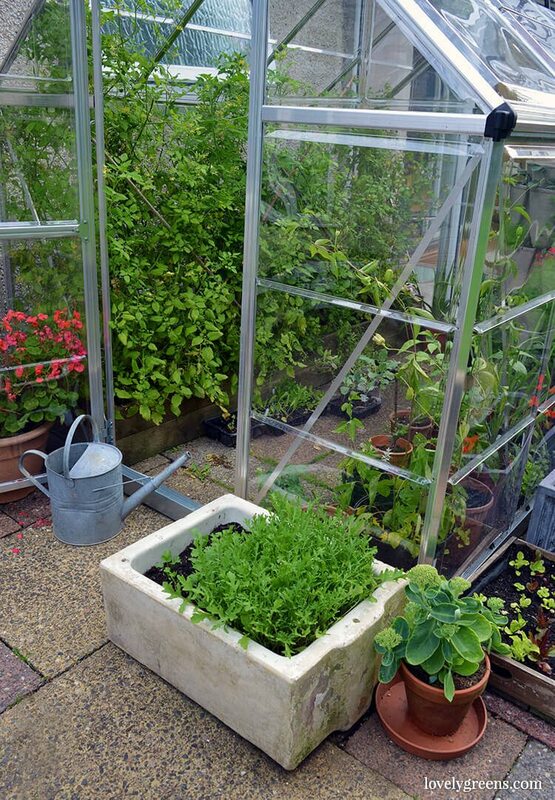 Great herbs to grow in that gorgeous sink. Gorgeous and HEAVY sink 🙂 My greenhouse isn’t going anywhere!